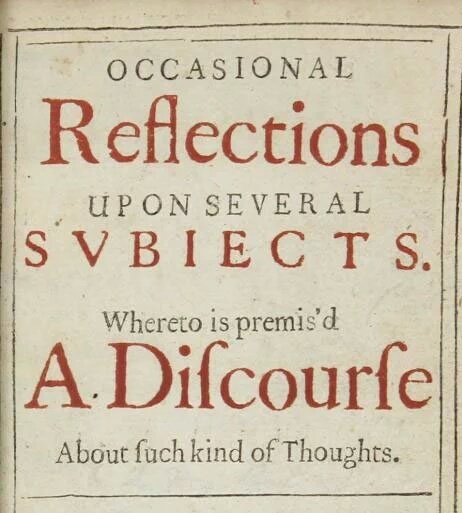 Yesterday I posted the endearingly vague book title shown above (which is actually from a book by Robert Boyle). When it appeared on Facebook I got some predictably rude comments about “fuch kind of thoughts”, etc, so I thought I’d post a little comment about the symbol “ſ'” which appears in the above. This character is sometimes called the “long s”. There’s a full Wikipedia article on this which there’s no point in repeating here, but I will just mention that the long s was used widely in manuscripts after the distinction arose better upper case and lower-case letters (which was around about the end of the 8th Century) where in the lower-case form, the “short s” (i.e. s) was used exclusively at the end of words or before an elision, and the long s everywhere else. It survived into the era of printing, not just in English but also in other languages including German. In fact “ſ” forms the left-hand element of the ligature “Eszett”, written “ß”, of which the other part is “z”. The long s fell increasingly out of favour in typography, partly because of the potential confusion with “f”, and partly because using the same “s” throughout a word is clearly tidier and easier to read: “sinfulness” is a lot easier on the eye than “”ſinfulneſs”. By the start of the 19th Century the long s had become a rarity; The Times phased out “ſ” in 1803. Oh, and the long s is also the original form of the integral sign, introduced to mathematics by Leibniz to stand for “summa” (sum), which he wrote “ſumma”. Gradually settling back in here to the School of Physics & Astronomy at Cardiff University, I thought I’d indulge in a bit of promotional activity and point out that, following on from the recent detection of gravitational waves by the Advanced LIGO Consortium, of which Cardiff University is a member, there are two opportunities open for jobs in gravitational physics. The current Cardiff Gravitational Physics group has expertise in gravitational-wave data analysis, numerical relativity and source modelling, and astrophysical interpretation, and consists of four full-time and two part-time academic staff, two research fellows, five postdoctoral researchers and nine PhD students. Our research is supported by the UK Science and Technology Facilities Council (STFC), the Royal Society, and the European Horizon 2020 programme. The group is a founding member of GEO600, a member of the Laser Interferometer Gravitational-Wave Observatory (LIGO) Scientific Collaboration and has played a leading role in these collaborations from their inception through to the recent first direct detection of gravitational waves, and is also active in planning and development of future detectors, such as LIGO-India, Einstein Telescope and Laser Interferometer Space Antenna (LISA). This new appointment is part of a long-term expansion of the group, to broaden and strengthen our current research in gravitational-wave astronomy, and to build a world-leading group in gravitational-wave experimentation. For the full advertisement, links to further particulars etc, see here. The current Cardiff Gravitational Physics group has expertise in gravitational-wave data analysis, numerical relativity and source modelling, and astrophysical interpretation, and consists of four full-time and two part-time academic staff, two research fellows, five postdoctoral researchers and nine PhD students. Our research is supported by the UK Science and Technology Facilities Council (STFC), the Royal Society, and the European Horizon 2020 programme. The group is a founding member of GEO600, a member of the Laser Interferometer Gravitational-Wave Observatory ( LIGO) Scientific Collaboration and has played a leading role in these collaborations from their inception through to the recent first direct detection of gravitational waves, and is also active in planning and development of future detectors, such as LIGO-India, Einstein Telescope and Laser Interferometer Space Antenna ( LISA). This new appointment is part of a long-term expansion of the group, to broaden and strengthen our current research in gravitational-wave astronomy, and to build a world-leading group in gravitational-wave experimentation, with additional appointments expected in the near future. For full details on this one see here. The second appointment is intended to build on existing strengths by adding a more experimental dimension to Cardiff’s research in Gravitational Waves.